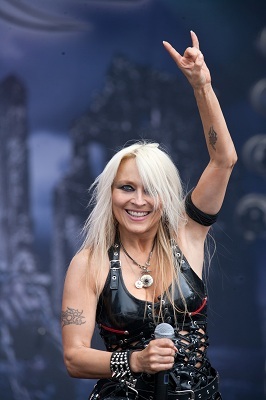 I recently spoke to Doro Pesch to talk about her new album, her forthcoming tour and her plans to celebrate her 30th year of metal in 2013. Festivalphoto: You have two guests on the album - Gus G and Lemmy. How do you decide who to invite to guest on your albums? Doro: I've loved Lemmy for such a long time. It was the early 80s when we met for the first time, 83, 84 in the UK, we did some festivals together, a tour together and on the "Calling the wild" album, that was 12 years ago, Lemmy played me this acoustic guitar ballad called "Alone again" that he wrote and I was so moved and so touched and I loved it so much. Lemmy is one of the most soulful singers that I've ever heard, so we did "Alone again" and "Love me forever" twelve years ago and since then we've done so much stuff together, playing concerts, and a long tour two years ago. Two and a half years ago I started working on this new album and I talked to someone, he was an ex boyfriend, and he said "I have a little boy now and could you be the godmother", and I went "Wow I'm so happy you asked me", but I have this gypsy life, so I wasn't sure so we had a long conversation, we're still friends, and after I hung up the phone I decided it was perfect, and then I wrote the song "It still hurts". I finished it in Hamburg with a friend of mine Andreas Bruhn, we've worked together for the last 14 years, and I played him the chorus and he said it sounds great but we need some verses, so we worked on the verses and Andreas was singing a bit and I was singing a bit and I thought it would make a great duet. I thought "Wow Lemmy would be so awesome on it", and I told Andreas I wanted to play it for Lemmy, so he made me a rough mix and I sent the song to Lemmy and I was so happy when he said he loved it and lets do it. We did Lemmy's vocals in March, and its always a great honour to have Lemmy on a song or album, and it means so much to me. He's one of a kind and it meant so much to me that he sang on this song, it's one of my favourites. The other guest, Gus G, that came through a mutual friend, Alex Krull from Atrocity and Leaves eyes, with the long hair. We met on a couple of occasions and his wife Liv Kristine sang on my last album - there was a "full metal female" version of the song "Celebrate" and she sang on that and she came to my 25th anniversary concert and he came as well and we said one of these days we had to work together, and we did on the song "Grab the bull (last man standing)" and he was playing stome stuff and re-arranging and then went to a music fair in Frankfurt, it's a big music fair, and he phone me and said "Do you know who I'm standing next to?" and I said "No", and he said "Gus G", and I was like wow this is awesome, and we'd played together last year, Firewind played Hellfest, so I said to Alex to ask Gus to check out the tune we were working on and ask if he wanted to play on it, and he gave Gus the song and Gus agreed and played guitars and solos on it. I think it's awesome. I always like to have some really special guests, I think for the fans it's something even more special and exciting and a surprise. Festivalphoto: "Hero" is dedicated to Ronnie James Dio. I think you wrote this one at least two years ago - was it the first song to be written for the new album? Doro: Yes it was, how did you know? Yes it was the first one about two and a half years ago. I had the chance to tour with Ronnie a couple of times. My first time was actually in 1987. He was my favourite singer and to go on tour together was mind-blowing, it was so great and we always stayed in touch and then we had another long tour together in 2000, and what was special about that tour was the 90s were when grunge was so huge and it was hard to keep metal going, so in 1999 people were saying "Metal is coming back" and I was in America doing the "calling the wild" album, and the record company guy said he knew I was a huge Ronnie James Dio fan and asked if I wanted to go to the release party for "Magica" and I said I'd love to, so I went there and said Hi to Ronnie. He said he wanted to tell me - "on this tribute album (Holy Dio: A Tribute to Ronnie James Dio) there is a version of "Egypt" from you guys and I love it, the sound the feel, I love it". We'd recorded it in Germany and New Jersey, and it was recorded by someone who had done my first demos, Rudi Kronenberger. Then I finished the album and did an interview with this radio station in America and they asked if there were any touring plans. I said "no, not yet but I'd love to go on tour and support somebody", and they said "we hear you're a big fan of Ronnie James Dio, and he's going on tour soon. He's calling in one hour for an interview, shall I suggest it to him" so I said yes. To make a long story short, a couple of weeks later we were on tour together. It was the best tour, because after so many years of grunge, metal was coming back, and we played so many places and everywhere was sold out. We started in San Francisco in the Filmore club where Janis Joplin and Jimi Hendrix performed and there were all these special venues, and we finished the tour in Florida. I was always watching Ronnie's show every night with my band, and suddenly Ronnie left the stage and I was like "where's he going", and my band tapped me on the shoulder and said "you know what's coming up", and they obviously knew but nobody had told me, and they said "You're on" and Ronnie came over and handed me a second microphone and said "Come on lets do the encores together", and I was saying I didnt know the lyrics properly but he said it didn't matter, and from that time on we really became great friends and did a lot of stuff together. We opened for Heaven and Hell. When I heard Ronnie had passed away it was devastating for many fans including myself and we did some concerts in memory of Ronnie. Later when I started the new record I was thinking of ideas and I often stay up till 5 or 6 in the morning and this one night I decided to go to sleep, and I was almost asleep when the melody and lyrics for "Hero" came shooting out. I always have my iphone or tape recorder so I sang it to have it and not forget it - some great ideas are still there in the morning but sometimes they are not, so I recorded it and that was the first song we did. We recorded it in New Jersey and some more in Germany. We recorded some more songs in Denmark with Jacob Hansen, he'd already mixed some great songs for us. Rudi said he'd do me some mixes of "Hero" and I listened to them and that was it - there was no need to take the song anywhere else, and it felt so good, and I thought that's the one. Festivalphoto: Right from the early Warlock days you've sung and recorded in English rather than German. What made you decide to do that? Doro: English is the international language of music. It was the thing to do, and I never even thought of recording anything in German even though I couldn't actually speak English, and then my very first song I did in German, I did when I moved to New York and we were doing the "Triumph and Agony" album (that was the album we went on tour with Dio for), that was the first time I did something in German. It was "Fur Immer". I think if I had stayed in Germany I'd never have sung in German. it's difficult sometimes, the words might be a little bit too long, it's not such a nice language to sing in so you have to be careful choosing the right words so they sound right, but "Fur Immer" that was the first time that something came out in German. Since then I've done things in different languages. On "Raise your fist in the air" we have a French version. I played "Raise your fist in the air" for the first time in Wacken last year, then in Moscow and France and they asked if I could do a French version so a couple of weeks later I tried and some friends helped with the translation. It's something I love, I've done songs in French, Spanish, Portuguese, the languages, sometime they fit a song perfectly. Sometimes I try and translate a German song into English but they don't feel the same, so if something initially comes out in a language then it seems to work best in that language. We always wanted to be an international band right from the start, and I was heavily influenced by the New Wave of British Heavy Metal, so there wasn't even a question about which language to sing in. Festivalphoto: You're an amazingly hard working artist having performed your 2500th show in March 2010, that's almost 100 shows a year every year for the last 25 years. Doro: Usually we do more than that, except when I'm in the studio, sometimes 250-300 shows a year. I'm sure we didn't even count all the shows (in the 2500), we left out some, and of course back then there was no internet so it was a hard time to count all the gigs but a couple of fans did it and I thought that was great, so now maybe we're up to 2700 shows. Festivalphoto: You've been announced for next years Wacken festival doing a special anniversary show. Have you planned what will happen yet? Doro: I want to do it in Wacken but I heard it is already sold out, so we've thought about if people can't get tickets, we definitely want to do two nights in Dusseldorf, my former home town, and maybe one night in New York. So two nights in Dusseldorf and I want to make it as nice as the 25th anniversary, that is hard to top, with the stage show and the guests so I thought the only way to top it is to do two nights, maybe do one with an orchestra and one really spectacular with special guests, some really great stuff. I still have a lot of time to think about it but I definitely want to celebrate with something big. On the 20th anniversary Lemmy and Mickey D and Saxon were there, and last anniversary the Warlock guys, the Scorpions, and all the ladies of metal and it was like wow. I definitely have to work hard to come close to that show I think, but we will try. Festivalphoto: It was a very long set at the 25th anniversary, around three and a half hours. Doro: Yes, did you go and see it live or did you watch the DVD? Festivalphoto: I was at the show. Doro: Thank you so much for coming and taking that long trip. Did you like it? Festivalphoto: I loved it - it was a fantastic show, but by the end of the night I was so exhausted I could barely stand up but you looked as though you could play for another three hours if your band had the energy. Doro: So you know it will be very hard to top that show. Actually a couple of hours later I ended up in the hospital because I was so exhausted, my whole face started to swell up and I thik I had an eye infection and I had to go to the hospital and because it was a Sunday it was just emergency doctors and they didn't know what it was. I told them it was probably the stress coming out as I'd worked one year for that show, so I was totally exhausted. I tried to top that show with the 2500th show and that night we played for three hours and forty minutes, and after the show some fans came up to me and said it was a great show but I hadn't played their favourite song, so three hours and forty minutes is not enough, so we'll do two nights in Dusseldorf. In Wacken I'm not sure how much time we will get, probably one and a half hours, but I definitely want to do something for the die-hard fans, who know all the songs and want to hear all the special songs too. First though I need to concentrate on this upcoming tour. Festivalphoto: You have a short European tour with one or two dates in each country. Doro: Yes and then in January we go over to America for the American tour for four weeks, and we do the 70,000 tons of metal cruise, and then we go to South America, then we are back to do the full metal cruise in May, it's run by the Wacken people for metal fans. Then all the festivals before we go to Russia and Japan and all over. After the festival season I want to concentrate on the anniversary shows, but the plan is to tour non-stop. The first leg is in November, and we play London and Bristol in the UK. I think it's close to sold out which makes me happy because England is such an important country and I feel so at home there. Festivalphoto: It must be a nice feeling when you walk out on stage and see the venue is full. Doro: Yes and when I feel the excitement in the air and see it in peoples eyes, it's so nice - it's the best feeling in the world, it's like pure love. I feel closer to my fans than to my close friends, somehow there's a connection which I don't have with other people. When I was 24 or 25 I made a conscious decision to dedicate my life to music, to metal and to the fans, and I'm so happy that nothing got in the way, no kids, no marriage, and I'm grateful for every day where I can hop on stage, when I can see the fans. With the show I hope people can relax and forget about everyday problems and just enjoy the show for two hours or one and a half hours or three and a half, however long it is. Sometimes there's a curfew so we can't play as long as we want to. Festivalphoto: Thank you so much for your time, it's been a pleasure to talk to you.